Earlier in this chapter, we defined milestones as tasks that usually have no duration and mark the completion of a significant phase of the project. To create a milestone, reduce the duration of the task to O. 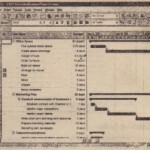 Project immediately converts the task to a milestone by changing the task bar in the Gantt Chart to a black diamond with the date above it. In Figure 7.13, Marketing plan developed shows an example of a milestone-the plan shows it being completed by February 14. When planning a project, it is not uncommon to plan for tasks that recur throughout the life of the project. 1. Click in the row where you want the recurring task to appear. 2. Choose Insert ~ Recurring Task (Project inserts a row for you so there is no need to insert a blank row first). 3. Enter a Task Name in the Recurring Task Information dialog box that appears (see Figure 7.14). 4. Enter ~ duration and recurrence pattern for one occurrence of the task The Project Review meeting shown in Figure 7.14 will be held for one hour every Thursday. Depending on whether you choose Daily, Weekly, Monthly, or Yearly, you have different options for the recurrence pattern. See Figure 15 for the choice available in each pattern. 5. Enter a date in the Start field for Range of Recurrence. 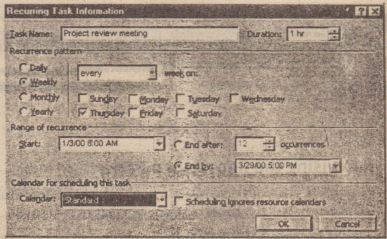 If the task is an event, such as a meeting, enter the start time also. 6. Indicate whether you want the task to end after a specific number of occurrences or by a certain date. 7. 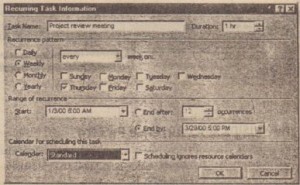 Assign a calendar for scheduling the task, if you want. If you don’t assign a calendar, Project uses the default Standard calendar. 8. Click OK to set the recurrence pattern. Project enters the task as a summary task with multiple sub tasks that represent each occurrence of the task. It differs from a normal summary task, however, as you can see in Figure 7.16. 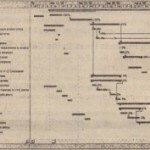 Each occurrence of the task is represented by a single blue bar in the Gantt Chart rather than by a solid black line. 1. Click the Show Sub tasks button on the summary task to view each task occurrence. 2. Double-click any of the sub tasks to open the Task Information dialog box for that occurrence. 3. Make any changes you want to make to the recurrence pattern or range of recurrence. The additional views that are available in Project provide options for looking at the project’s information in different ways and for accessing flelds that are not readily available in Gantt Chart ytew. Although Gantt Chart view is the default Project view, it is not the only view in which you can enter tasks. 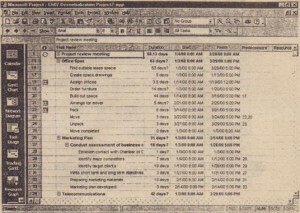 Several other views, such as the Task Sheet view shown in Figure 7.17, focus on tasks and can be used to enter and edit tasks. Many of these views are most valuable when you have. linked tasks and are assigning resources. To access the predefIned views, Choose View> More Views and choose a view from the Views list. For a detailed description of each of the major views and how to use them most effectively refer to 17, “Using Views to Evaluate Data. 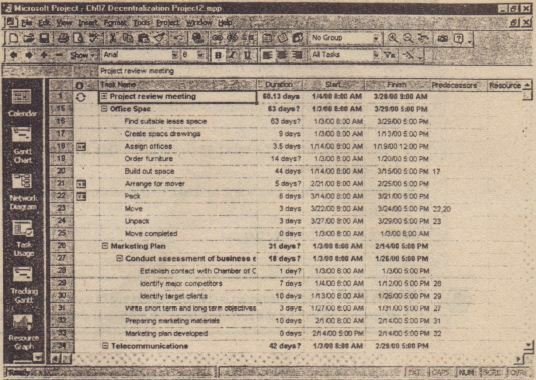 Project 2000 shares its spelling features with other Microsoft Office 2000 applications. If you are familiar with how to correct spelling in Word or PowerPoint, you already know how to check your spelling in Project. To use Spelling in Project, click the Spelling button on the Standard toolbar. Project reviews all the text in the project. flags possible mi spelled words, and opens the Spelling dialog box shown in Figure 7.18 . Ignore this occurrence of the word. Ignore All occurrences of the word in this document. Add the word to the Custom dictionary so Project/Office recognizes it the next time you use it. Change the word by choosing one of the suggested corrections or editing the word manually . • Change All occurrences of the word in this document by choosing one of the. suggested corrections or editing the word manually. AutoCorrect the word (after choosing or entering a correction) and add it to the Auto Correct dictionary (see” Automatic Fixes for Common Errors, ” later in this ). Because Project checks the spelling of words even in fields that are not currently visible, it identifies where the word was found to help give you a context for the word. The word found in. 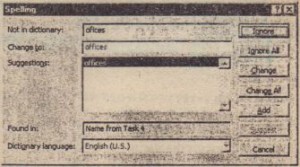 Figure 7.18 was found in the Name field from Task 15. 3. Project warns you that you must restart the spelling checker for the dictionary . to tale effect. Click the Close button to the Cancel button to close the Spelling dialog box. 4. If the language you selected was not previously installed, Project’s Install on Demand feature runs. You must have access to the program files from the CDROM or network installation path. As long as Project can find the install.msi file, it installs the alternative dictionaries. 5. Rerun Spelling by click the Spelling button or choosing Tools ~ Spelling to cheese the spelling in the new language.